In the January issue of Craft Stamper magazine, Keren Baker is sharing a fabulous idea for creating backgrounds, a subtle version of the Josephs Coat technique. 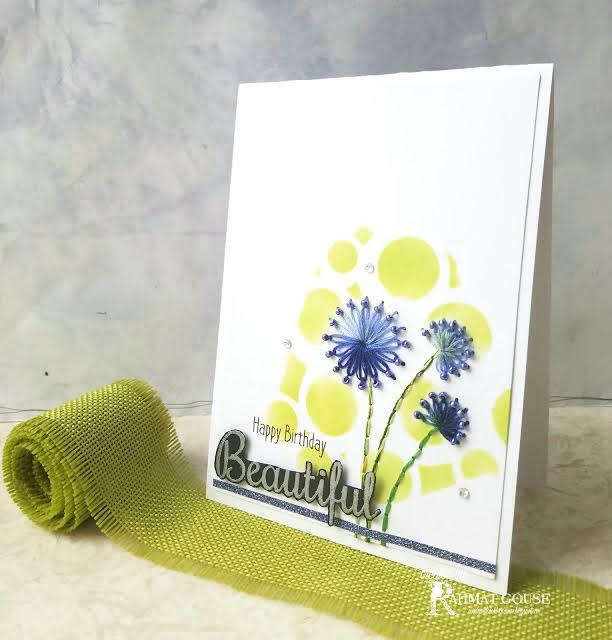 Keren shares a full step by step tutorial as part of the magazine feature, and today we are sharing one of the gorgeous cards she created using that technique. We love it! 1. 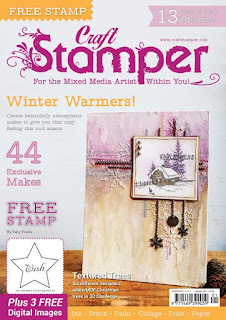 Stamp lots of snowflakes onto a piece of Dura-lar and white heat emboss. 2. Stamp some more snowflakes onto a spare piece of film and cut out. 3. Arrange onto the project after folding up the snowflakes to make them more 3D. 4. Die cut letters and a colour to act as a shadow for the letters. Attach together with the darker colour slightly offset. Add to the base card after layering with some red card and patterned paper. We have a busy week here on the blog, our regular Throwback Thursday post tomorrow and then the launch of the December challenge on Friday! It's all go here! A start to a busy week here on the blog! Today we are sharing a fab step by step from Tracy Easson. In our January issue, Tracy shares a fabulous plushie with us. A superb painted face, Tracy style! 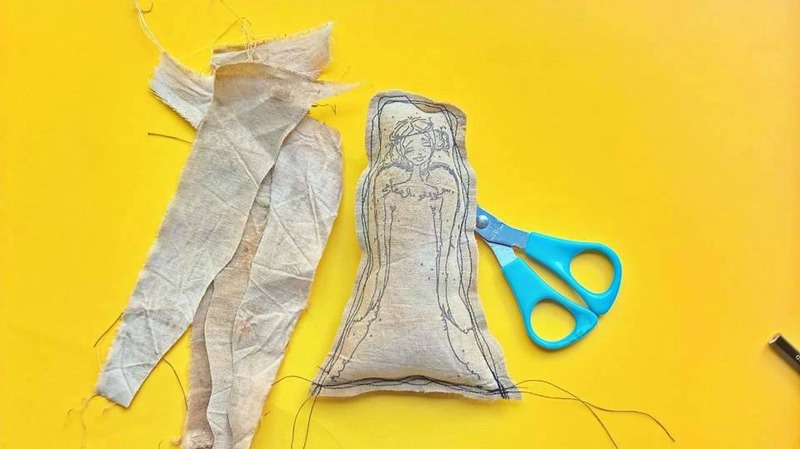 This extra content just for the blog shows us how to create your own plushie! 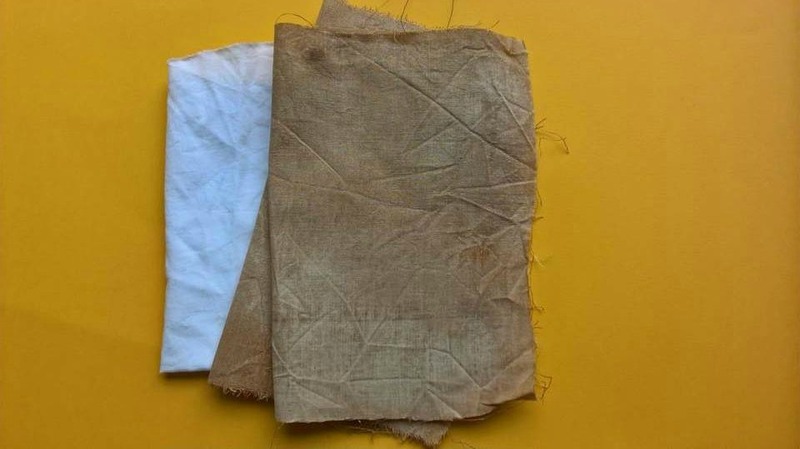 1 Prepare fabric by soaking in a mixture of cold water and coffee, leave to dry. 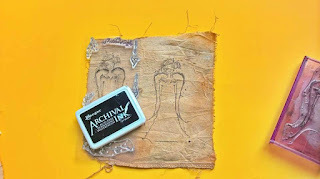 2 Ink up stamp with an Archival ink pad and then stamp onto fabric. 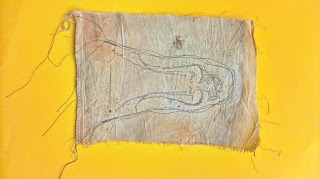 3 Place another piece of fabric behind and machine or hand stitch together, remembering to leave the bottom open. Repeat three times. 4 Use a soft toy filler to stuff, using a pencil to push it into the smallest spaces. 5 Stitch the bottom closed. To finish the project: Cut away the excess fabric and used to stamp the sentiment onto. Fix it in place with a few stitches. Complete with a little rusty bell held in place with a safety pin. We love her Tracy, thank you so much for sharing! 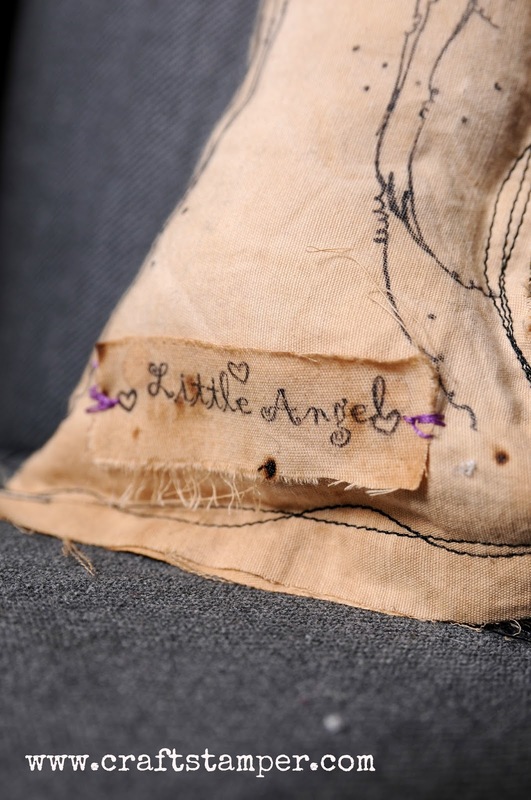 Don't forget to check back in tomorrow for another EXCLUSIVE blog project from Keren Baker! Our Inspirational January Issue hits the shops on Friday! Our January issue hits the shops this Friday (2nd December), subscribers will be getting their copies very soon if not already! 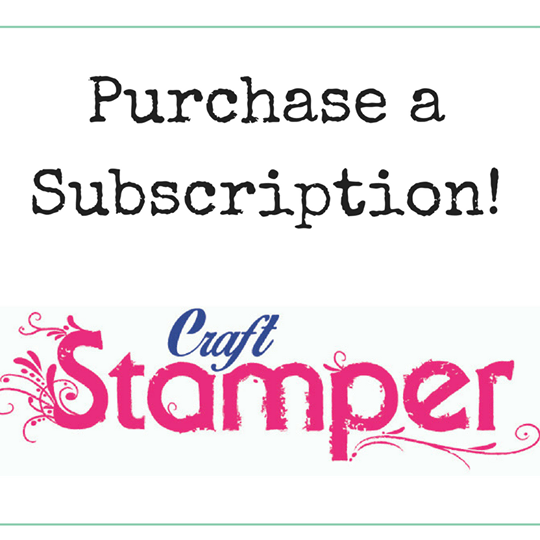 The January issue is a very special one... it is the 200th Issue of Craft Stamper! I am so pleased to reach this amazing milestone! I think I have every single one of those 200 issues stored in my studio, and I know I’m not alone. 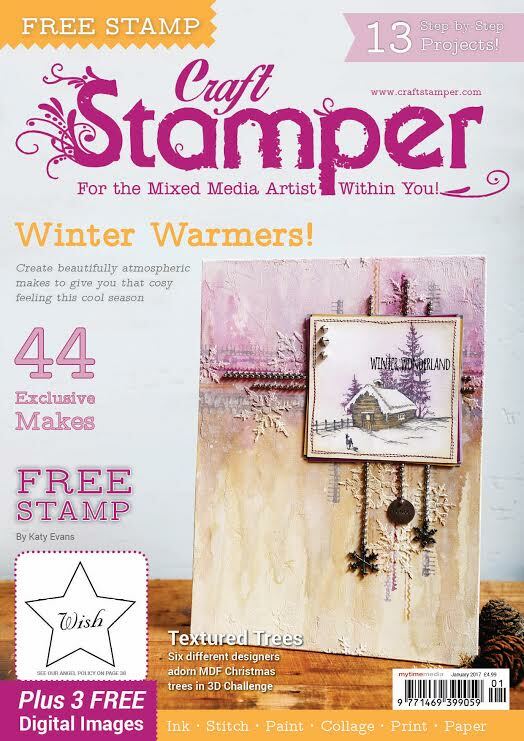 Thank you all for helping us create the most wonderful stamping and mixed media magazine around… here’s to the next 200! We are still feeling decidedly wintery in this issue! Jenny Marples is sharing the most STUNNING canvas on page 18.The colours are gorgeous, you really need to check it out! For those of you who are fond of your Distress Crayons (who isn’t! ), Kim Dellow takes us through five great techniques with them in this month’s Masterclass. 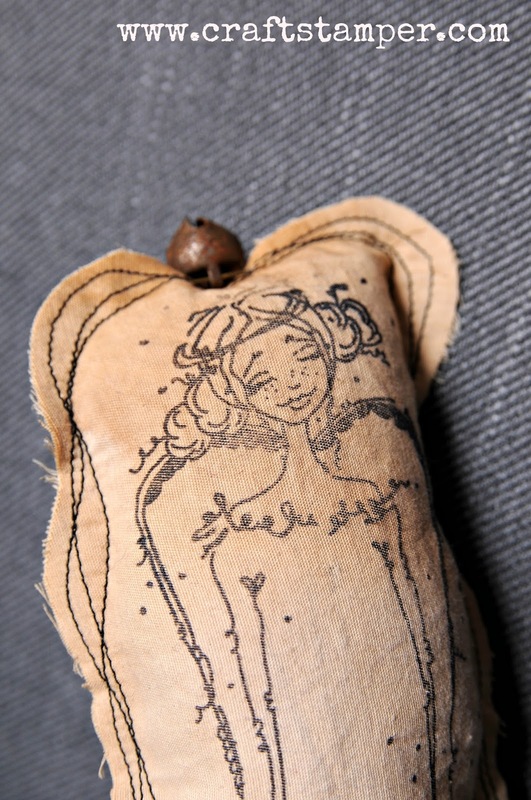 I love experimenting with different ways of using my stash; there’s always something new to discover! and Ingrid Vichova, both of whom are sharing makes using them in this issue. Wonderful job, ladies! 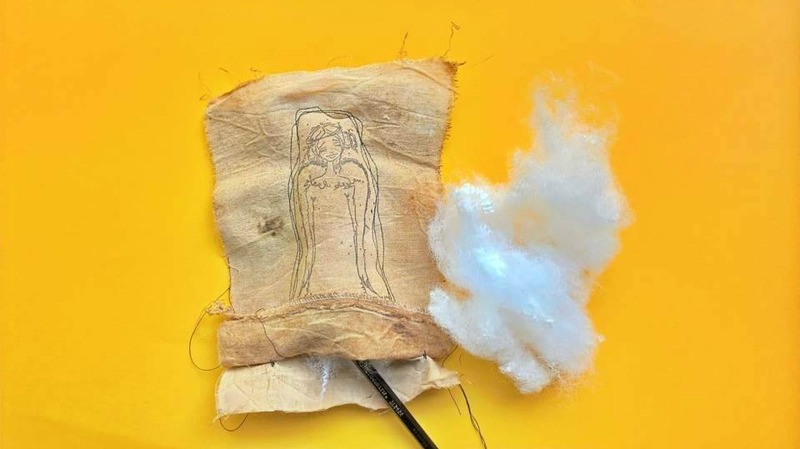 All information about the digital images can be found on page 38.
and an amazing plushie by Tracy Easson in this issue! 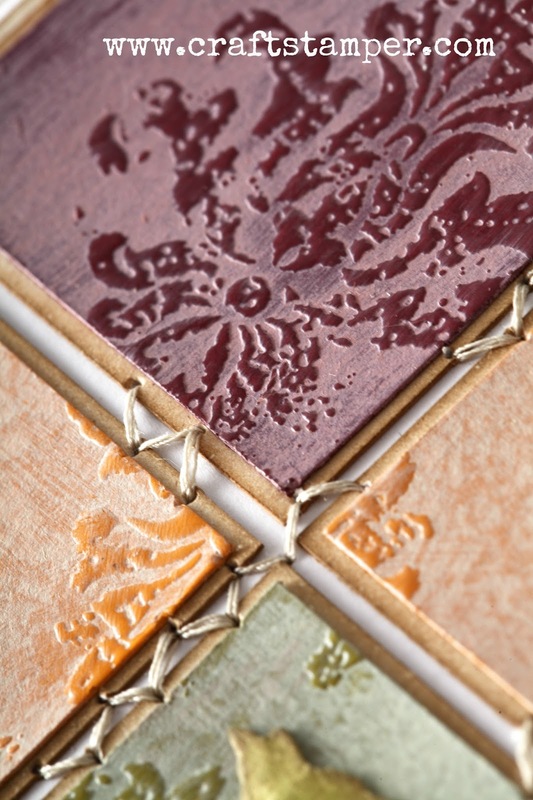 We loved this textural panel! 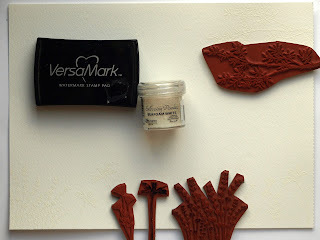 The stamping into the paste is fabulous, wonderful pop of colour... and a really good tutorial too, should you want to pop over and see! 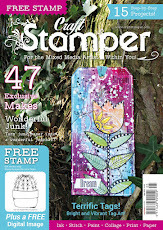 Hannah will win a Guest Designer slot here on the blog, her very own Winners Profile, and of course her amazing art will be featured in it's own 2 page spread in Craft Stamper magazine! Congrats Hannah! This month, the DT all had lots of favourites (easy to do, there was so much amazing art to choose from! ), so we have a tie for the remaining slots... this month we have a top FIVE! Top Five Design Winners, also please contact me if you wish to receive a button to display on your blog. Our December challenge will be launched next Friday, December 2nd. With scenic stamping you can create your very own landscapes, the only limitation is your imagination. 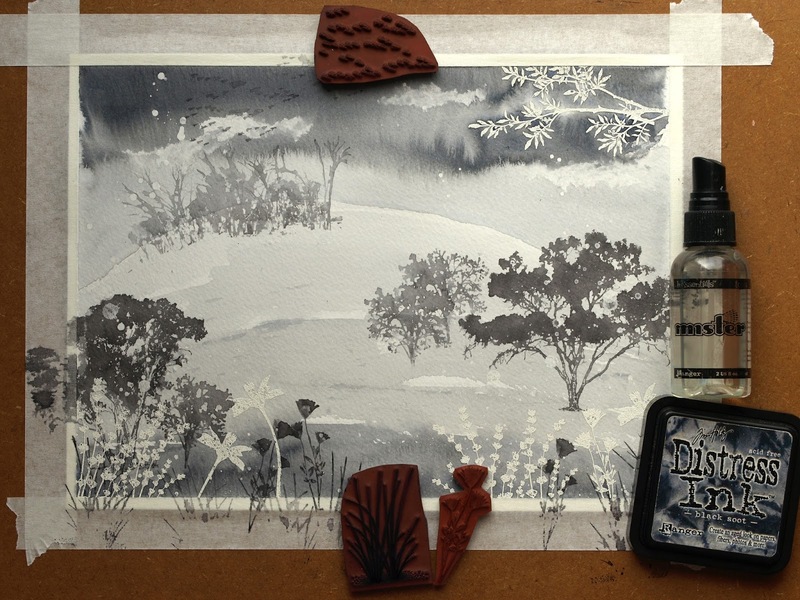 Let scenic stamping carry you away to places of your dreams, or you can recreate a well-known and loved place, maybe using a photo as reference. I like to sometimes add cut out photos to scenes, often of my son, and he loves to see himself walking around in a fairy tale landscape. I love the look of black and white photos, which might partly explain why I like to do black and white scenes. Doing a monochrome scene is not only effective and fun, it is also a great way to practice your colouring skills, in particular relating to light and dark. Working in only one colour makes you focus on tone (the lightness and darkness of a colour), light and shadows. It is a great way to learn more about this. I did my scenes in greyscale, but you can also use other colours for a monochrome scene. One of my favourites is blue, which works great for night time or winter scenes. Or try green for a great nature feel, purple for drama or brown for a vintage look. Mist and splatter a little Goosebumps Texture Spray on a piece of watercolour cardstock (A4 or Letter Size). Leave to dry for a resist effect. You can skip this step if you want to. Stamp and heat emboss a branch at the top right-hand corner, and grass and flowers at the bottom. 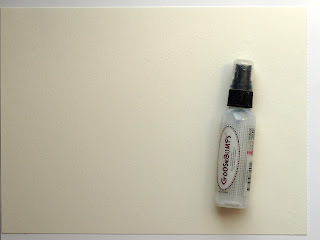 Use white or clear embossing powder. 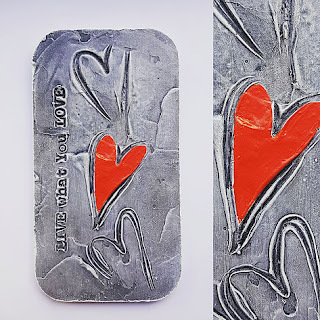 The embossing will resist the paint. 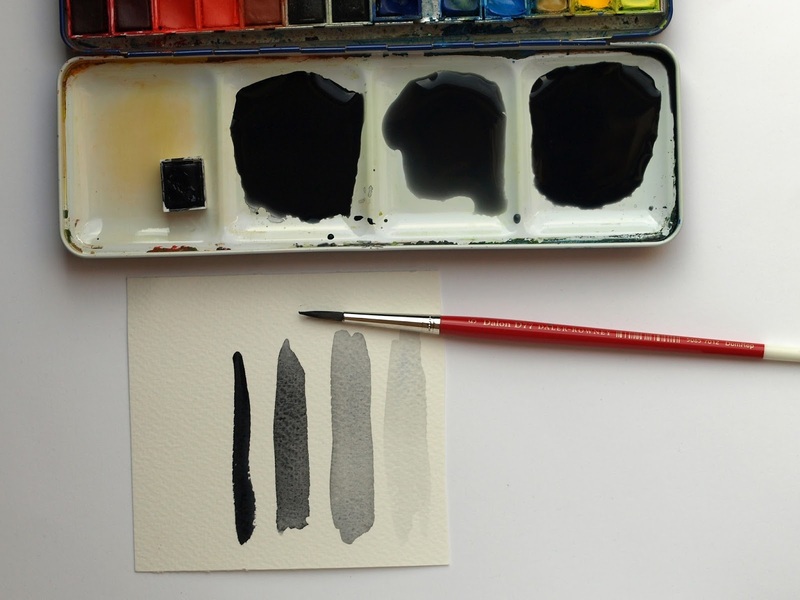 Choose one watercolour colour, preferable a dark one which has a wider tonal range than light colours. I used Payne’s Grey. Mix three or four different strengths, varying the amount of water. You can also use Black Soot Distress reinker. Adhere the paper to a board with masking or gummed tape. If you use a smaller paper, this isn’t necessary. Paint the sky with clean water and then with a dark and light mix of paint. Blot out clouds with tissue paper. 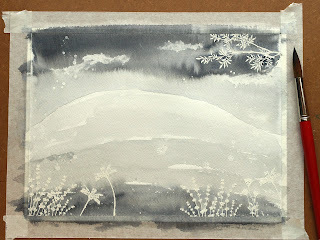 Paint the hills with the three paint mixes. Start with the lightest mix towards the horizon, the medium mix in the middle and the darkest mix at the front. This helps to create a sense of perspective. 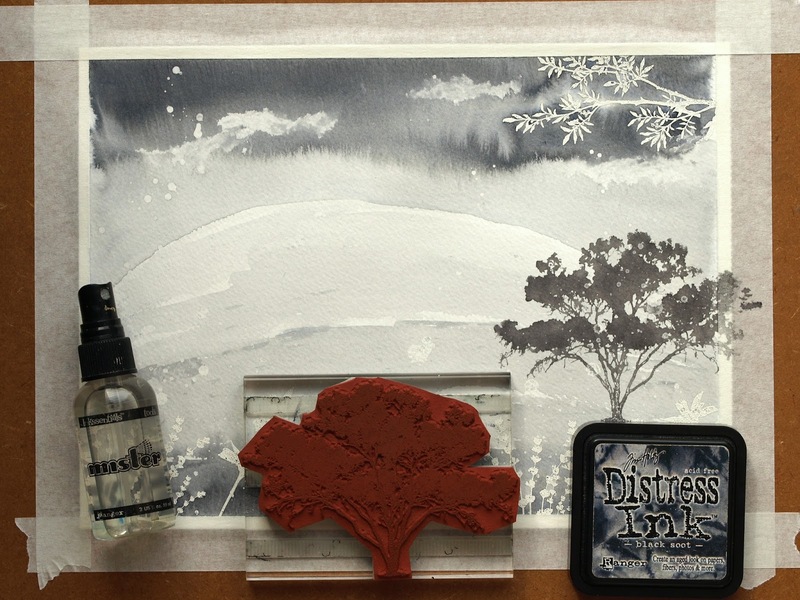 When the background is dry, ink a tree stamp with Black Soot and mist 4-5 times with water. Stamp and hold for a few seconds to give the ink time to transfer to the paper. This creates a great watercolour look. 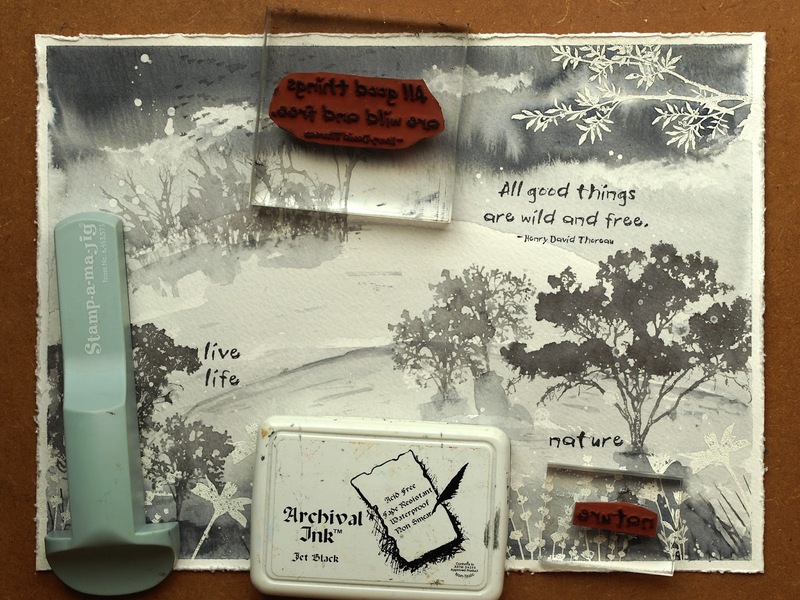 Continue with more tree, bird and flower stamps. Try to use smaller stamps further back in the scene, and stamp them lighter – ink the stamp, mist with water, stamp once on scrap paper, mist twice again and stamp. 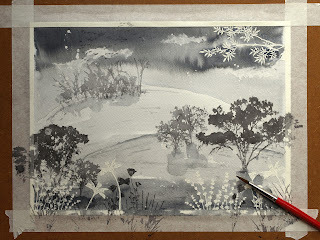 When the paint is dry, use the medium mix to add shadows to the trees and dry brush a little bit of paint on the grass. Again, remember to keep it lighter the further away into the scene you go. Stamp a few sentiments with Jet Black ink. I use a stamp positioner for sentiments on a finished scene, to avoid messing it up with crooked stamping. 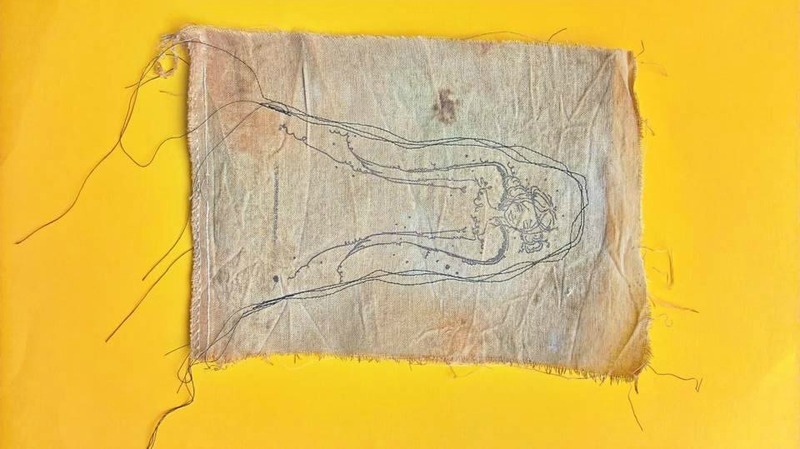 Wipe paint and ink off the heat embossed and splattered areas. 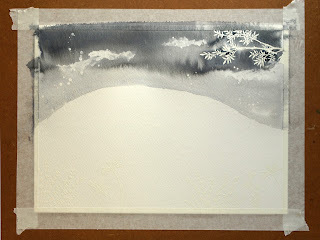 Distress the edges, which gives a great look to watercolour paper. Mount on black cardstock. Cut out a photo, or use a stamped image. Move it around to see where it looks best. 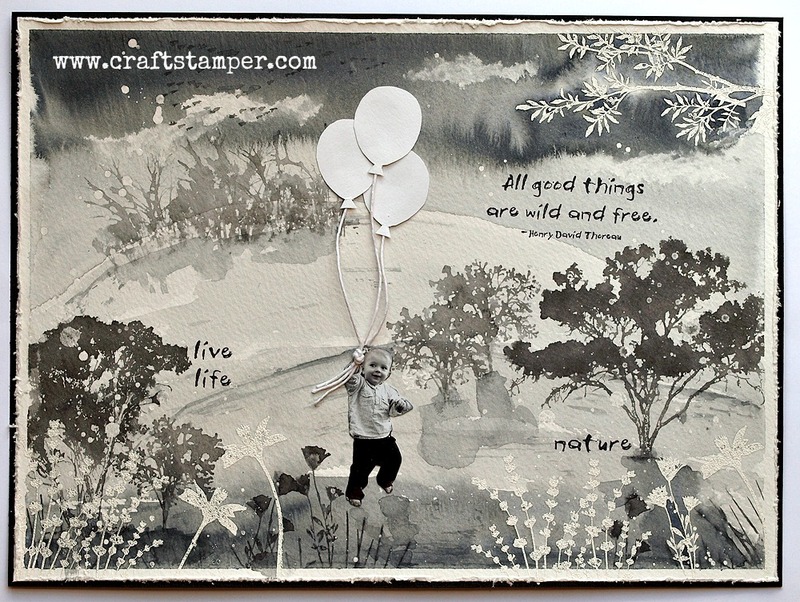 Cut out three balloons from white cardstock and glue twine to them. Tie a knot and glue to the hand of your character. Wow! The end result is just stunning.. thanks Anna Karin! Don't forget to pop back next Thursday, we'll be sharing another blast from the past technique with you all! 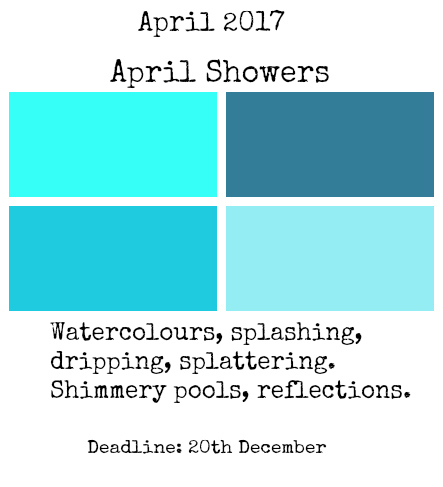 Colours: Aqua, Steel Blue, Teal, Duck Egg Blue. 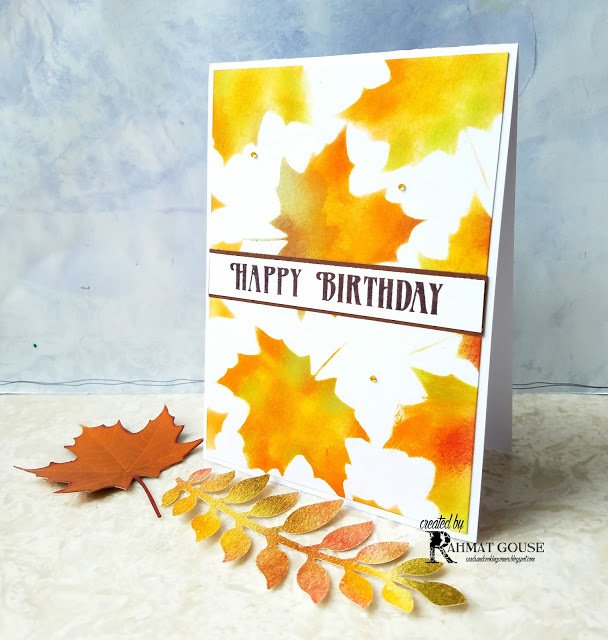 Rahmat won the challenge with this fabulous Autumnal card! We loved the beautiful colours of the leaves, the inks have blended so wonderfully together! A: I started stamping just 2 over years ago. Prior to that I used to make cards, only for my kids birthdays and special occasions, but with no stamping on the cards. 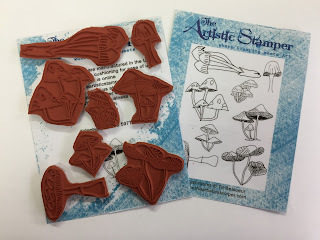 I was looking for a hobby to keep myself busy, as my kids are already in their teens, and ended up coming across so many blogs featuring the stamps. Until then I had practically no clue what stamping was! I was like a little Alice in the Wonderland, who wandered around blogs and YouTube, and taught myself all from scratch! It was a big challenge to find stamps for me, as the place I live in has no crafting supplies. I researched a lot, and finally found the nearest place was Hong Kong, which is a different country! Believe it or not I go to Hong Kong, which takes an hour by sea. I cross immigration, and then visit my craft store to buy my stamps. But oh what fun it is! I simply love it despite all the challenges. 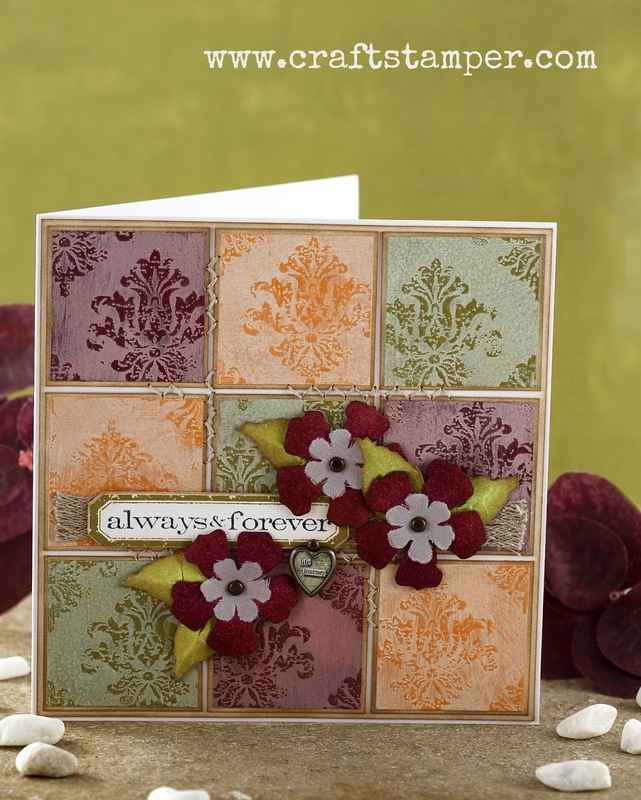 A: I love flowers, and background builder stamps the most. I have a decent collection of most of the popular brands, and I love most clear stamps. A: It took me a while to discover my very own style, when I started in 2014. I was all over the place. But it took me a very short time to figure out that I love ‘Clean and Simple’. I do try out other techniques, but CAS is my calling. A: I make mostly cards, all occasion cards. I try my best to include sewing on my cards, as and when possible, as embroidery is my first love. Congratulations on being our October Design Winner Rahmat , and it was lovely to learn a little more about you! Our current challenge 'Take A Stamp' is open until November 23rd, so still lots of time to enter! Don't forget the fabulous prize of The Artistic Stamper stamps! See you back here next Friday, where we will be annoucing the November Winners! Good Luck! Our fabulous project today was created by Jenny Marples, and was first published in December 2014! Distress paints are still just as popular, so why not have a go at creating this simply goegeous card? Distress Paints are fluid water-based acrylic paints which can be used on multiple surfaces. These special paints have been designed specifically to be reactive with water (just like Distress Inks and Distress Stains) so they are perfect for accomplishing a wide variety of artistic techniques. This technique, used previously by Tim Holtz, is the perfect way to give your projects a vintage style, reminiscent of aged fabrics and wallpapers. Originally demonstrated using black card, here I’ve shown a way of using coordinated Distress Paints to produce subtle, chalky coloured versions. 1 Begin by covering several squares of thick card with a coat of dark coloured Distress Paint, and allow to dry completely. 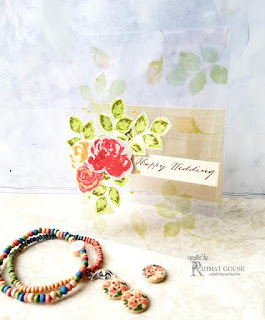 2 Using one of the Distress Damask stamps, embossing ink and clear embossing powder, stamp and heat-emboss the painted squares as shown. 3 Dab on some of the lighter coloured Distress Paint and sponge an even layer over the whole card. 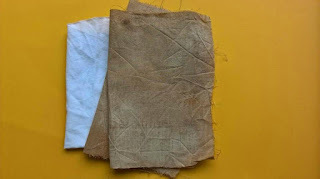 4 When touch-dry, wipe over the embossed areas with a slightly damp cloth to remove some of the paint. Repeat the technique using three colour combinations on nine 4.5cm square pieces of thick card. Mat and layer the squares onto white card blended at the edges with Frayed Burlap Distress Ink. Sew zigzag stitches between some of the squares with coordinating cotton thread. Glue two pieces of Linen Ribbon across the card. Stamp the Simple Sentiment using the Archival Inks and cut using the coordinating die from the Framelits set. Die-cut some flowers and leaves, colour with Distress Inks and shape them. Having cut smaller flowers from nylon net fabric, layer and attach to the card using Long Fasteners. Finally attach the Heart Charm using a Mini Fastener. Thank you so much Jenny, wonderful inspiration! Check back next Thursday for another blast from the past project!